The Face Shop Real Nature Face Mask "Pomegranate" ~ $3.00. This Pomegranate Face Mask reduces the appearance of the first signs of aging and helps improve skin's elasticity. Rich in antioxidants, pomegranate provides skin with long-lasting hydration and a radiant complexion. The Face Shop masks are my affordable go-to masks - they just moved from $2 to $3, but still thats a reasonable price. They fit really big, but have enough tabs to be smoothed on to the face well. This had lots of essence and made my skin feel nice and refreshed! GLAMGLOW Flashmud Brightening Treatment ~ sample size 0.5 oz for $24.00. A multi-targeted, multi-sensorial quick results brightening treatment for radiant, youthful-looking skin. This mask smells soooo good and it is goes on in circular motions and you rinse off after 20 minutes. I loved how this made my skin look at feel! 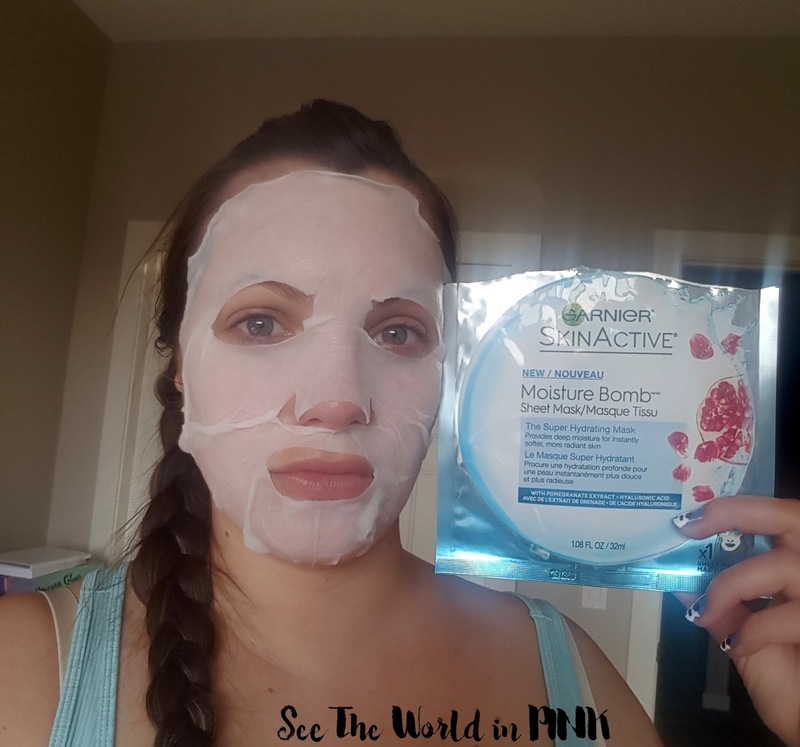 I love what this mask does to my skin - it made my skin look and feel great! Really brightening! I featured this quite a long time ago on a past Skincare Sunday (see the full post here). Repurchase: Maybe - I really like this on my skin, but the full size is expensive! I mixed these 2 masks together because that is what they did for my facial a little while ago! I mixed both together and applied a generous layer to my face and left on for 15 minutes, then rinsed off! I love the aha because it is tingly and pepperminty and the klearity works well for my blemishes! This mask is so cool looking - I think I looked like a dragon in it! It was silvery and scaley! But that was as good as it got with this mask - it didn't fit well and didn't make my skin feel better at all. Skin Formula Skin Check Squalane Activated Moisturizing Black Mask ~ $??. Squalane has a high degree of penetration and excellent skin-friendly, combined with hyaluronic acid moisturizing ingredients, deep penetration of keratin conditioning oil and water balance, improve skin water retention, reduce skin color uneven. Continuous moist horny, add water, from the inside out of the water and shiny. Hahaha - if you read the translation from their website, it's a little confusing! I don't remember where I got this mask, but it's really hard to find any information online. 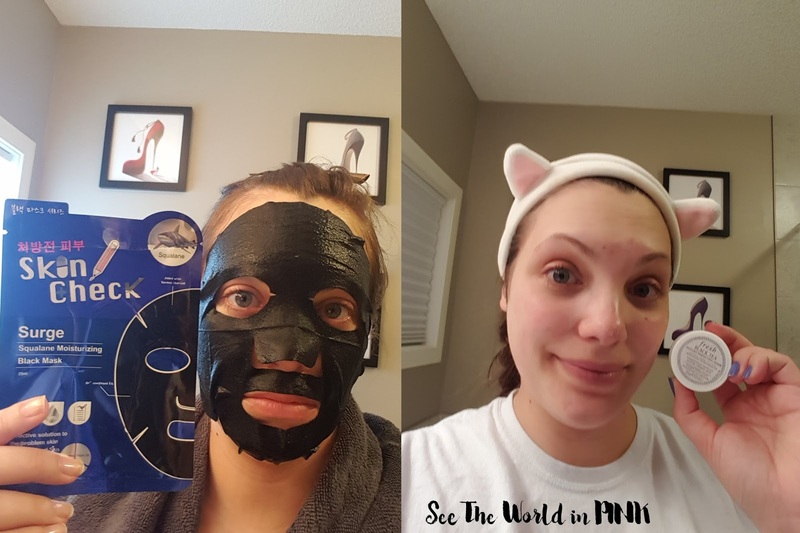 I love these black masks, I find them extra hydrating and moisturizing on the skin. That's exactly what this one did for my skin! Fresh Black Tea Instant Perfecting Mask ~ sample size (full size is 100 ml for $112.00). Black Tea Instant Perfecting Mask with advanced antioxidants is a hydrating treatment that immediately reveals softer, firmer, healthier-looking skin. The innovative formula’s velvety whipped texture has an immediate cooling effect to refresh the skin and the senses. Black tea ferment, also known as Kombucha, is an advanced antioxidant that helps to defend against wrinkle-causing free radicals while softening, smoothing, and enhancing luster. The formula is further enriched with lychee seed extract, known to support natural collagen, firming polysaccharides that help to smooth the skin, and jicima root juice, notable for its hydrating and nourishing properties. This is a leave on mask and it has a really great texture - it is light and velvety and feels so smooth on the skin! This smells amazing and made my skin look really good! I loved this! I reviewed this for a Skincare Sunday post last year - you an see the detailed review here! Garnier SkinActive Moisture Bomb Mask ~ $3.99. The super-hydrating technology, with hydrating serum, hyaluronic acid and naturally-derived ingredients, recharges the skin with moisture for 24 hours. The mask strengthens the skin's natural barrier function to protect it from external aggressions and preserve its youthful appearance. 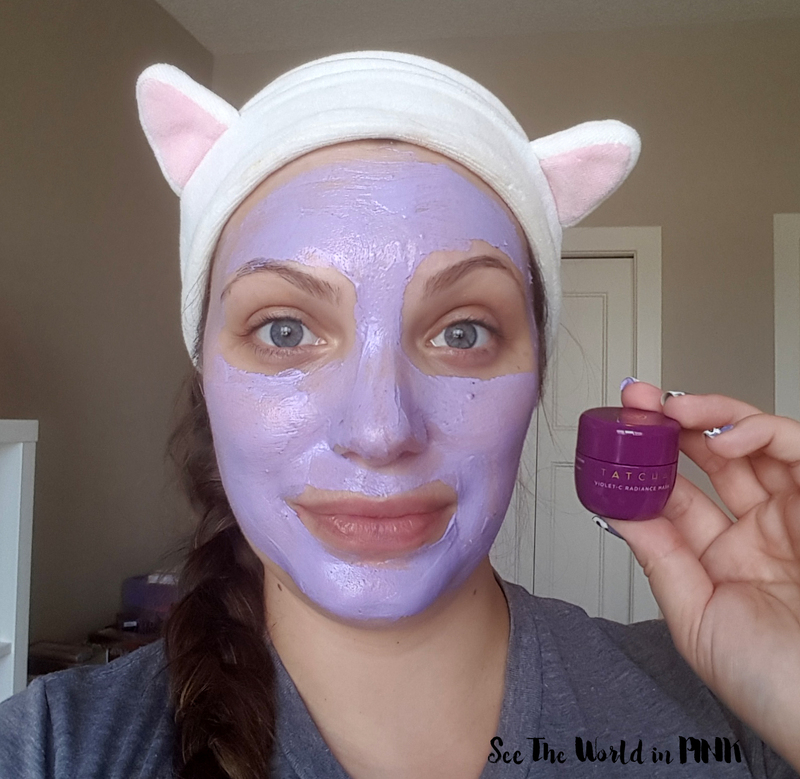 This mask came well soaked in essence and it was a little big on me, but because of the essence it smoothed down on my face well! It was cooling on my skin and refreshing! 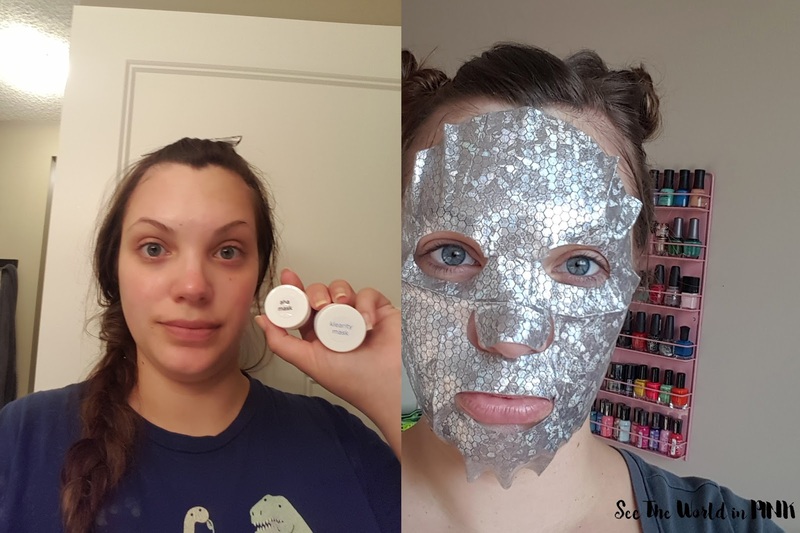 I reviewed this on a Mask Wednesday post - you can see the whole post here! Tatcha Violet-C Radiance Mask ~ $79.00 CAN (sample size pictured). A creamy anti-aging mask—packed with Japanese beautyberry, two types of vitamin C, and AHAs from seven fruits—that unveils softer, glowing skin. 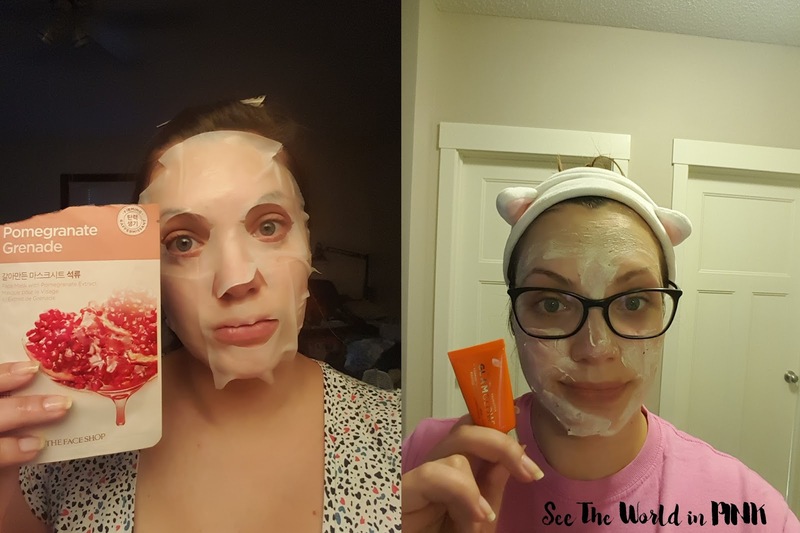 Another Mask Wednesday reviewed mask - you call see my detailed thoughts here! But long story short, this did not work well on my skin at all! This was supposed to be brightening; but, it just made my redness more prominent and my skin drier. Bummer. Nature Republic Real Nature Mask Sheet - "Avocado" ~ $2.00. Increases skin absorption potential. Hydrates with nutrients and moisturize with natural ingredient essences. I got this in an in8beauty subscription and I like Nature Republic masks - this had a creamy essence and had lots of essence! This was a little bit big on my face but lasted a while and made my skin feel really hydrated! Repurchase: Maybe, I wish it fit better! 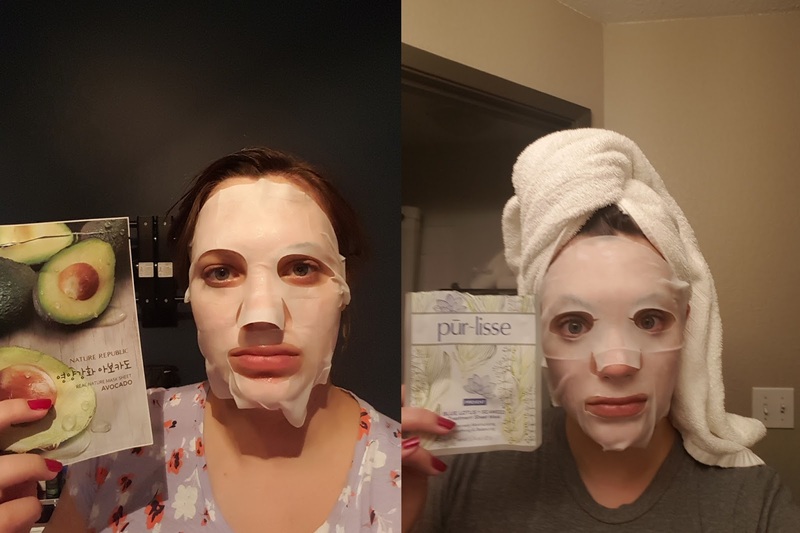 Pur~lisse Beauty Blue Lotus + Seaweed Sheet Mask ~ $8.00. This natural fiber mask infused with Blue Lotus, Seaweed and restorative Asian botanicals delivers antioxidants and minerals to your skin. This power blend fights soothes & nourishes while White Mulberry brightens and Anise fruit provides continuous moisture, leaving skin healthy, beautiful and radiant. This mask came really soaked in essence, but there was almost too much essence - it was dripping off the bottom of the mask. This worked pretty good - it was a fairly basic mask, made my skin soft and smooth but nothing outstanding. Not worth $8 in my opinion, maybe $3 or $4. I used 11 masks in July - not nearly as much as I like! But, with 2 weeks vacations and living out of suitcases, it has been a little harder to maintain a really good skincare routine! Hopefully August is a little calmer (my skin can use a little TLC).